Looking for a day of fun for the entire family? 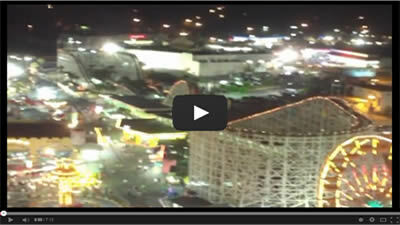 Head on over to the Family Kingdom Amusement Park in downtown Myrtle Beach, South Carolina. At Family Kingdom you can hop on more than 30 exciting rides including the Slingshot Drop Zone (a 110 ft free fall), the Swamp Fox (a famous wooden roller coaster), a log flume, 2 go-kart tracks (an oval and a figure 8), bumper cars and much, much more. The Family Kingdom Amusement Park also has an abundance of rides for the the little ones in the family. The younger kids in the family will enjoy riding the canoes, a carousel, a kiddie coaster, a kiddie speedway, kiddie swings, a kiddie Ferris wheel, 4 X 4 big trucks, antique cars and much, much more. Family Kingdom is also home to the only Ocean Front Water Park in Myrtle Beach. From Family Kingdom you can step across Ocean Boulevard to the water park and splash your way through an exciting day of fun. Enjoy 3 wild water flumes, 2 exciting speed slides, a deluxe 425 ft lazy river with refreshing waterfalls and more. The little ones in the family will love the 8 slides just for kids, splash pools and waterfall. Visit our oceanfront hotels page for lodging conveniently located on Ocean Boulevard near the Family Kingdom Amusement Park.